Good day, fellow minifigs! 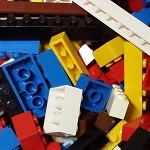 Today, we’re going to use some LEGO engineering to build a deck truss bridge that’s not just cool-looking, but functional as well. 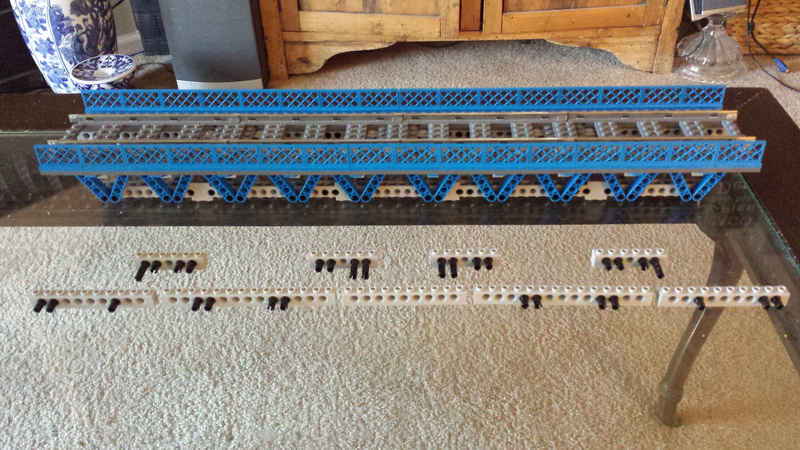 The completed bridge will be 64 studs long, 12 studs wide, contain 281 bricks, and utilize a pair of Warren trusses. A Warren truss uses equilateral triangles and gets its name from James Warren, the engineer who patented the design in 1848. This truss design is best-suited for carrying spanned loads, a good example of which is a train. This bridge and its twin will carry a single track through the city at the upcoming Brickworld Fort Wayne show in October. 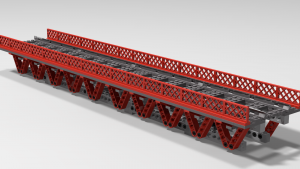 A rendered image of the bridge we’ll be building today, made with Stud.io. Trusses perform the simple yet essential function of load-bearing. They are lightweight, yet strong support structures that scale easily and can be built to the specific needs of their loads. Trusses come in many designs, though all use triangles in some way since the triangle is the simplest shape for distributing load and maintaining rigidity. Each design – such as the Warren, Pratt, or K truss – has its own advantages, disadvantages, and intended uses. The different designs simply use triangles differently to achieve their intended load-bearing capabilities. This bridge is called a deck truss bridge because the truss is underneath the bridge deck. Building the bridge this way reduces the total material cost since it doesn’t have to allow trains under or through the trusses. To learn more about trusses as I did, visit the links below. Let’s start building, shall we?